Last night I had that bad dream. The one with the crying baby and the slammed door and the gun. Only this time when I got to the part with the detectives, I was sitting across from myself. But I was both characters. In one sentence I could feel all the pain from the past. Then I became the other person and I bore my soul to myself. I talked about angels and grace. I told myself about all the moments that I knew I wouldn't be alone. I pleaded with myself to fight and screamed all the reasons why I was going to have to be strong. Then I became her again. The broken girl. Alone. Afraid. I looked around the room as it began to spin. The voices of my new reality swarming all around me. My eyes searched for something to look to. And then there I was...I looked into my own eyes staring across from me. I could feel myself pulling me to fight. I could feel the whirl wind of fear trying to bring me down. It was almost like a battle between darkness and light. But then all the sudden I was filled with this unmeasurable amount of strength. In my head my own voice calling my name and saying, "Ashlee...It will be hard...it will be dark...it will be humiliating...it will be lonely...and it will feel impossible. But you will stand." All the sudden the noise became more quiet. The voices of the detectives still repeated the facts of that night but the little broken girl who once sat alone on the couch...was standing. So powerful. Thank you for sharing. Peace and strength to you always! 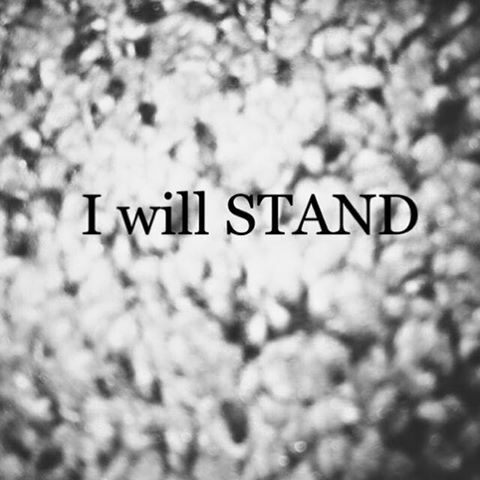 YOU will STAND! Thank you for sharing your life with all of us!